For a limited time, use coupon code Ibiza18 in the “Design Your Ibiza” form below to get $1,000 off your very own Ibiza! Add Washer - Dryer Combo Unit (electric ventless)? 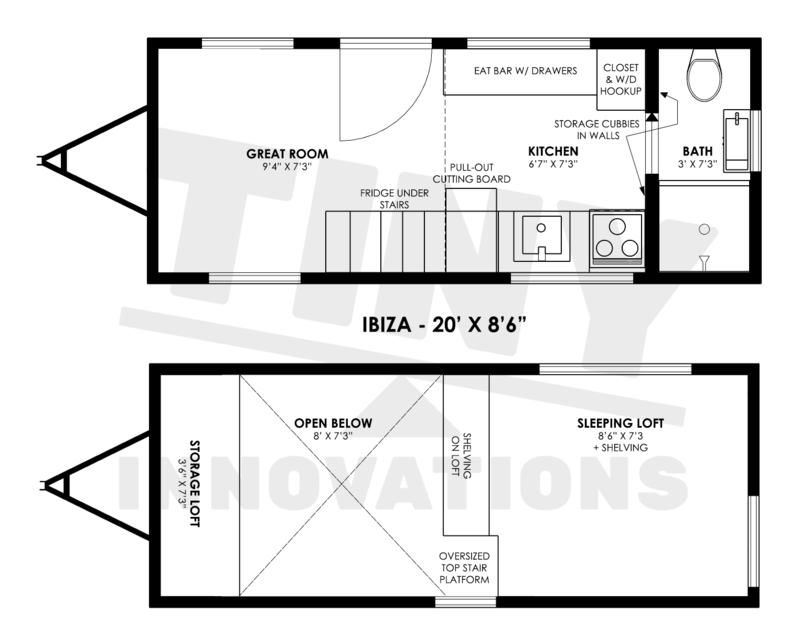 Introducing the Ibiza – our most affordable complete tiny home model! But don’t let the price tag or the 20′ length fool you – this home is spacious enough to sleep 4 to 6 people, has an open, airy feel, and features an incredible amount of storage. It is the embodiment of efficiency, with features like a hideaway butcherblock sinktop, glass-covered range, and pull-out cutting board for lots of counter space. Make the Ibiza your new home – on wheels! Options include solar packages, a built-in couch with storage, and more! Countertops – one slab 1 in. thick butcher block in walnut or cherry. Appliances – high end energy efficient stainless steel – 1 mini refrigerator, 1 propane cook top range and stove combo.